The StellaGuard solution combines smart technologies to provide universal brand protection. It leverages the advantages of a barcode and connects it with a three-dimensional visual reference that provides instantaneous authentication with copy-detect protection. 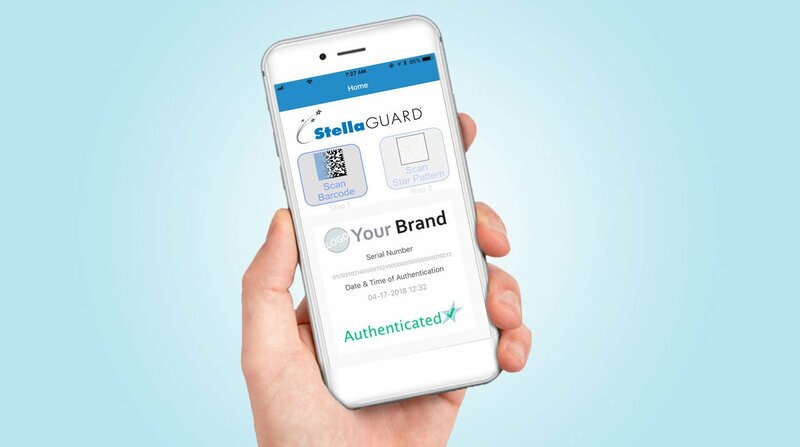 StellaGuard is a patented and elegant solution to protect your assets, enabling trusted stakeholders, including customers, to authenticate a product using common everyday smart devices. The StellaGuard security label embeds a random and unique pattern of holographic symbols in the proprietary label film when it is manufactured. Unlike barcodes, a StellaGuard Security Label is copy-detect. Connecting the serialized barcode with the StellaGuard Security Label on the packaging line creates two-layers of protection. In addition, StellaGuard supports serialized codes and protects the uniqueness of all codes from duplication. It can be used with any existing serialization platform to comply with the European Union Falsified Medicines Directive (FMD) safety feature regulations.